One of the most important factors in having a consistent swing is correct posture. Every golfer, no matter how good or bad they may be, could always use a little assistance when it comes to swing techniques and approaches. Sometimes it may be a case of poor mechanics. Other times it may simply be a situation where they may have trouble repeating the proper motion. Either way, every golfer could always use tips from someone who may be watching and can give them an opinion on how to do something different. Maintaining the correct posture is the first step in consistently swinging a golf club accurately and successfully. The key to maintaining good golf posture is to approach the ball with a straight back and then slightly bend your knees (bending them too much will cause your stroke not to have enough power behind it). Always keep your head straight toward the target and your eyes on the ball throughout the entire swing. Similar to baseball, if you do these two things you will be guaranteed to hit the ball well. 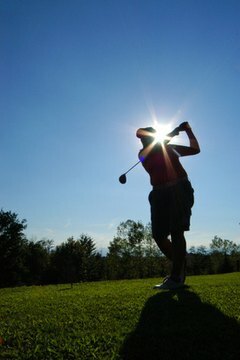 Watching the ball through the swing and also while it is in the air will train you to learn the differences and tendencies that you may have in certain situations. Proper elbow release is a very important part of successfully swinging a golf club. When starting your swing, be sure that your elbows are slightly bent. As you continue to your back swing and follow through, allow your elbows to ease and release at the same speed at which your knees are moving (this will ensure you get the most amount of power in your swing). As simple as it sounds, clear your mind of all other thoughts before swinging at the ball. Once you are only thinking about hitting the ball, it will become that much easier to focus on the ball mentally and visually, which should lead to stroking the ball better on a consistent basis. Always follow through your swing completely and with energy. The moment any golfer begins to follow through weakly, they don’t receive optimal ball flight or speed due to the fact that their swing is actually slowing down prior to full contact. If you completely follow through, then the swing won’t slow down until the very tail end of the swing, which will always earn you fast, farther, longer and more accurate shots. Marc Jenkins has been writing since 2008. His work has appeared in numerous online publications, and he is also co-host of the Double Play Sports Hour, a sports talk radio show on WBCR 1090AM in New York City. He studied English and mass communications at Virginia State University.